We were so proud of the amazing singing as well as the respectful behaviour of our choir members during Whistler’s Remembrance Day ceremony. Despite the rain, there were many in attendance. 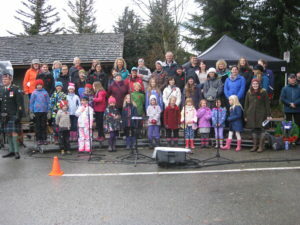 The sound was great – thanks to our amazing sound guy Andrew – and the Whistler Children’s Chorus and Whistler Singers were in fine voice. The choir sang wonderfully & scarily at our first concert of the year. 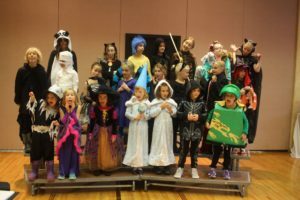 Our Lady of the Mountains Church was the gathering place for ghouls, witches, mummies, lions, stormtroopers, princesses and so much more at our Harvest Moon concert held on October 30th. The concert was a great start to our singing year! Registration for the upcoming 2016/2017 of the Whistler Children’s Chorus is now open online. Brochures will be available at the Whistler Public Library and Maury Young Arts Centre mid-August and at the elementary schools at the end of August. However, we encourage you to register online. You may now pay choir fees via e-transfer – please contact us for details. What better way to get ready for the new choir year than by a singing boot camp? The Whistler children’s Chorus is excited to offer our 1st choir boot camp. Whether you are a returning singer or choir is new for you, this week filled with music, song and fun is for you! Running from 9 am until noon daily at the Maury Young Arts Centre, singers will explore a range of music styles as well as music and instruments. Healthy snacks are provided. Registration is limited and now open.